Analysis of Aesthetical Value on Drama "The Proposal"
Home Analysis Drama Analysis of Aesthetical Value on Drama "The Proposal"
The definition of value in Oxford Dictionary is the regard that something is held to deserve; the importance, worth, or usefulness of something.Mentioned in Thesaurus Dictionary that value is beliefs of person or social group in which they have an emotional investment (either for or against something) for example He has very conservatives value. Important and lasting beliefs or ideals shared by the members of culture about what is good or bad and desirable or undesirable. Values have major influence on a person’s behavior and attitude and serve as broad guidelines in all situations. When we study literary there some activities, one of them is appreciate. Appreciate is the part of purpose in study literary that consist of three part such as value, empaty, and feeling. In this study we concern about value. That is the activities to score a esthetical in literary, experiences, and the meaning or the function of literary in society. Aesthetic value is the value that an object, event or state of affairs (most paradigmatically an art work or the natural environment) possesses in virtue of its capacity to elicit pleasure (positive value) or displeasure (negative value) when appreciated or experienced aesthetically (University of Nottingham, 2013). Moreover, Aestheticvalueisthecoverofbeautyitself, thatbeautycan beenjoyed bythe eyes, soul, feeling, and also ears. Allthesethingsregard towhat is seenbythehuman (Iam, 2011). 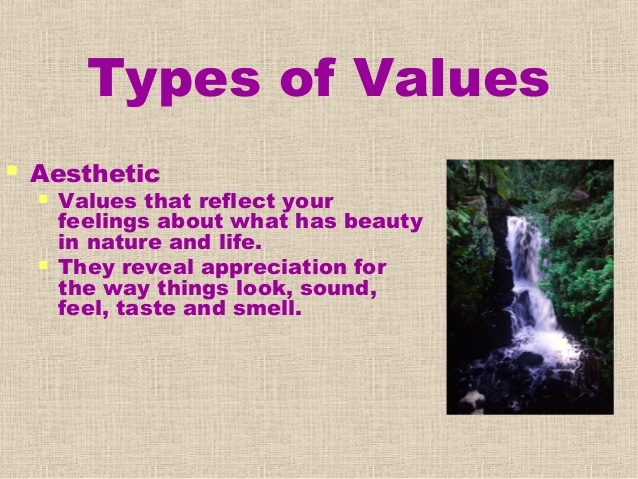 Everything that is valuable is valuable in a variety of ways. Art objects often have sentimental value, historical value or financial value. Wilderness can have economic value as well as recreational value. But great art works are thought to possess a distinctive sort of non-instrumental and non-utilitarian value that is of central concern when they are evaluated as art works. It might be thought that this value is beauty, but many artworks are not beautiful. So it is more plausible that beauty is a particular species of the value in question. The aesthetic value that a work of art possesses (and most would extend this to the natural environment) has to do with the sort of experience it provides when engaged with appropriately. If it provides pleasure in virtue of our experience of its beauty, elegance, gracefulness, harmony, proportion, unity, etc., we say that it has positive aesthetic value. If it provides displeasure in virtue of ugliness, deformity or disgustingness we may say that it has negative aesthetic value. One important thing to note is that the pleasure or displeasure underwriting aesthetic value is best thought of as directed at the object in question rather than being merely caused by it (Stecker, 1997). Summary of Drama "The Proposal"
Margaret Tate is an executive editor in chief of a book publishing company. After learning she is about to be deported to Canada because she violated the terms of her work visa, she persuades her assistant, Andrew Paxton, to marry her. She reminds Andrew that if she's deported, the work he put in as her assistant will be lost, and he'll be set back in his dream to become an editor. Mr. Gilbertson, a U.S. immigration agent, informs them that he suspects they are committing fraud to avoid Margaret's deportation. Gilbertson tells them that they'll be asked questions about each other separately. If their answers don't match, Margaret will be deported to Canada and Andrew will be convicted of a felony punishable by a $250,000 fine and five years in prison. Andrew insists that Margaret make him an editor after their marriage and publish his book. Margaret agrees. The couple travels to Sitka, Alaska, Andrew's home town, to meet his family. Margaret meets Andrew's mother Grace and grandmother Annie. During the trip to the family home, Margaret notices that nearly every shop in town carries the name Paxton and learns that Andrew's family is in fact very wealthy. During a welcome home party, Andrew confronts his father, Joe, who is angry about Andrew's dating the boss he has so long disliked and thinks he is using her to get ahead in his career. After their argument, Andrew announces the engagement to everyone. Margaret also meets Gertrude, Andrew's ex-girlfriend. At the wedding ceremony, Margaret confesses the truth about the wedding to the guests, including Gilbertson, who informs her she has twenty-four hours to leave for Canada. Margaret returns to the Paxton home to pack her things. Andrew rushes to their room only to find Margaret has already left, leaving his book manuscript with a note of praise and a promise to publish it. Gertrude attempts to comfort Andrew and asks if he is going to go after her. As he rushes out to find Margaret, another argument arises between him and Joe. Annie fakes a heart attack and convinces them to reconcile before she "passes away". After she succeeds in getting things moving again, she owns up to faking the attack. Andrew's parents realize he really loves Margaret. He goes to New York and tells Margaret he loves her in front of the entire office staff. They kiss, then go to Gilbertson and inform him they are again engaged, but for real this time. Grandma Annie: “ ….. you are getting married this weekend! Based on the data, Getting married is an exciting time but it requires a lot of planningand willneed toprepareeverything. After grandma Annie knows the news that Richard is going to home in Alaska with Margareth, she plans a wedding party for them. Based on the data, theexpectationthatcancome trueis thehappiest thing. it can be seen that the grandma annie’s dream become a real and she is very happy about this. She is hopeful at the end of her life, she can see Richard get married soon. Based on the data, Dear is used as a form ofaffection. It can be seen that Debbie (Mother’s Richard) loves with Margareth because she think thatMargareth became a part of the family. And Margareth will be a wife of Richard. Based on the data, love is caring and respecting with someone. It can be seen that Richard respect with his grandma. So, he willmake her happy and proud of him. Moreover, he doesn’t want to see his grandma was sick and disappointed. Based on the data, she shows how she feelshappyforfunorspecialevent. It can be seen that Debbie feels amazed with the wedding dress of grandma annie when grandma shows it. Based on the data, it knows that Debbie loves Margareth because she prepared the wedding dress for her to try on. She wants to see her beautiful at the wedding ceremony. So, that’s why she cares with her. Based on the data, promise is a commitment by someone to do something. It can be seen that Richard will do anything for his grandma. Because of that his grandma asks Richard to promise that he continues to be part of the family and didn’t fight again with his father. Based on the data,It can be seen that Margareth shows the affection to Richard in front of his family. So, the familyof Richard willbelievethattheyarea romanticcouple. Based on the data, it can be seen that Richardwas amazedat the Margarethbecauseshe looksveryprettywhenwearinga wedding dressintheirweddingceremony.And Richard doesn’t realize that he gives praise to show his admiration for her. Based on the data, it can be seen that after Margareth telling the truth about the relationshipbetween them, the Margareth and Richard eventually fellingg love and she promised to live together happily. Lesson Learn from Drama "The Proposal"
The lessons can be taken from this drama is whenwehaveaproblemthat happens to us, live witha cool head. Then, think about whatwe will donext. Thinkcarefullysolutionwe will dolatertodeal withit. Do not let thesolutionthatwe have plannedwillhappen tousas well as others, oreven toourfamilylater. Face theproblemstogether. Take thebestwaytosolve it. Although the honesty is hard to do but we have to say anything based on the reality. Because a honesty can create a something goods and can make everything.